Salt is sodium chloride and it is essential for our health, but too bad it’s almost in everything we eat. Although it is a great food preservative for thousands of years, it is used today to promote processed foods that say “Preservative-Free”. This of course allows food manufacturers to have a marketable food product with a longer shelf life! Here are the reasons why you should watch your salt intake. OBESITY: Almost 70% of Americans are either overweight or obese. Salt does not cause weight gain itself but it does make you thirsty, this leads you to drink more fluids. Unfortunately many Americans reach sugary drinks which of course can cause weight gain because they contain a lot of energy. This is a major problem for children and teenagers as a third of the fluids they drink are sugary soft drinks. OSTEOPOROSIS: Our bones are the main reservoir of calcium. People who eat a high salt diet can cause this calcium to be extracted from bones and excreted in the urine. This will consequentially make bones weak and easily broken. STOMACH CANCER: A quarter of the 7000 new cases of stomach cancer each year can be attributed to salt. Helicobacter pylori (H. pylori) is a bacteria that naturally resides in your stomach. High salt intake allows this bacteria to overpopulate and can lead to inflammation of the stomach which can in turn lead to stomach ulcers and stomach cancer. CARDIOVASCULAR HEALTH: One in 20 deaths in America is caused by stroke. If a stroke episode does not kill someone, it will affect their daily function from paralysis. High blood pressure is the single most important risk factor for stroke and salt is the major factor that raises blood pressure, salt is therefore responsible for many of these strokes. Stroke is not an inevitable part of aging and many can be prevented by keeping blood pressure under control, through salt reduction, exercise and healthy eating. WATER RETENTION: Feeling a bit bloated all the time? 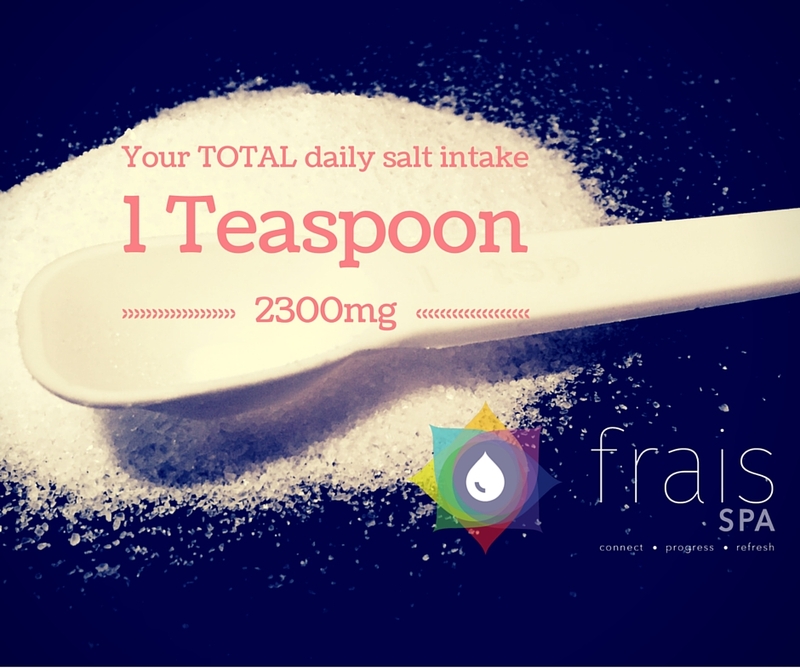 A high salt intake causes us to retain water. People who find they suffer from bloating may see this condition improve when they watch their salt intake. This can also take less stress off of your kidney function as well.The average American consumes 3400 mg of sodium everyday. How much do you have per day? Take a personal survey by starting a food log. A good one to use is MyFitnessPal, a free smartphone app that will not only track your sodium, but also the other nutrients in your diet. Many medical conditions can be prevented by watching what we eat. You should start now before it is too late. It is more simple than you think.